Learn the secret of success by achieving more with less. Find out how you can tap the hidden potential of the 80/20 principle in your life. Richard Koch is a highly successful entrepreneur and investor. 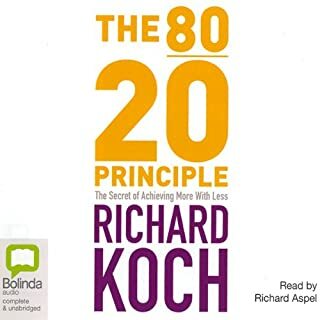 His 80/20 Principle - that 80 per cent of results flow from just 20 per cent of the causes - is the one true principle of highly effective people and organizations. The idea of the book is worthy, but much too long explained and with a lot of hours without anything to do with Pareto principle. The narrator is quite to listen. Anyway, I think it deserves the time and money.